Digital education technology is a key component of the contemporary student learning experience and often underpins ‘flipped classrooms’. Flipped classrooms reverse classroom content and homework by assigning students instructional content as preparation for class and consequently free class time from lecture for other activities. While they are adopted with relative ease in traditional classroom settings, the science laboratory presents more challenges due to infrastructure and safety considerations. This study investigated the utility of flipped classrooms in a University undergraduate microbiology laboratory. Introductory lectures formerly delivered in class were pre-recorded and made available in advance. Quantitative and qualitative data from a student survey revealed that the pre-recorded introductory lectures used to flip the microbiology laboratory engaged and benefited many students. Students considered that the flipped laboratory 1) assisted them in preparing for laboratory classes independently and at their own pace; 2) enabled more class time to complete tasks, 3) enabled them to revisit and clarify confusing content; and 4) provided revision material. 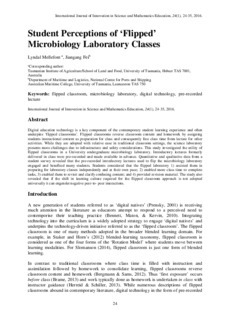 The study also revealed that if the shift in learning culture required for the flipped classroom approach is not adopted universally it can engender negative peer-to- peer interactions.